The above graphic, from the Antibiotic Resistance Project by the PEW charitable trusts, summarizes how alarming the emergence of drug resistant bacterial strains has gotten over the past few decades. 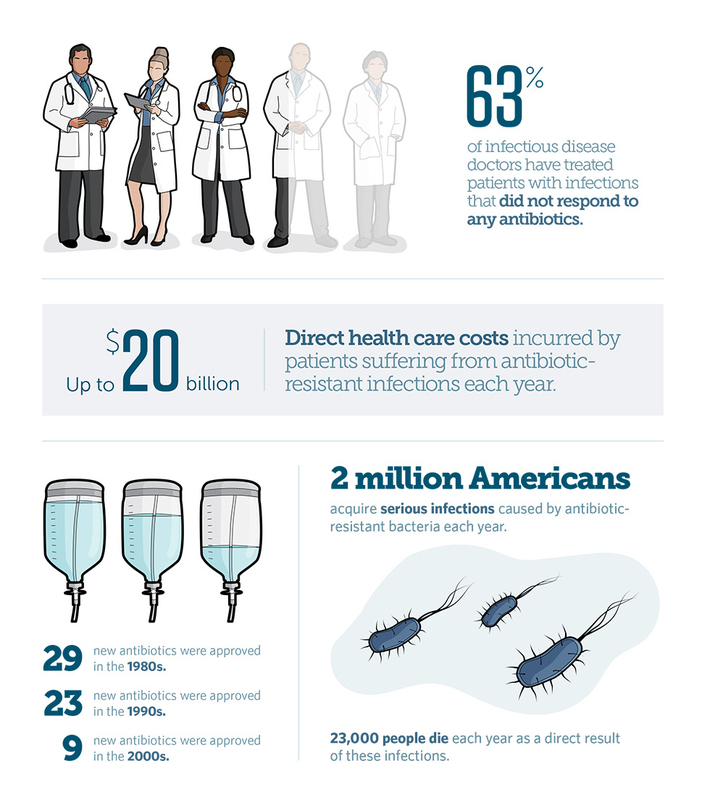 According to data from the Center for Disease Control (CDC), every year 2 million Americans acquire drug-resistant infections , in other words infections that do not respond to treatment with ordinary antibiotics. Not only do drug-resistant infections require much stronger drugs, but, when not deadly, they often leave patients with long-lasting complications. One of the scariest threats is carbapenem-resistant Enterobacteriaceae (CRE), bacteria that are resistant to several kinds of antibiotics. In 2001, only North Carolina, out of all 50 states had reported one CRE infection. Last year, in 2015, 48 states reported CRE infections to the CDC. And while drug-resistant strains emerge rapidly, the discovery of antimicrobial substances has stalled: in the last decade, only 9 new antibiotics were approved, compared to 29 discovered in the 1980s and 23 in the 1990s. We are fighting a new war, and we are running out of weapons. How does drug resistance emerge? Bacteria constitute an irreplaceable building block of our ecosystem: they are found in soil, water, air, and in every living organism. In humans, it's estimated that they outnumber our cells by 3:1, and numerous studies have shown that not only do they help us digest and produce enzymes that our body wouldn't otherwise be able to break down, but they can also influence gene expression and certain phenotypes (see some of my past posts for more information). They live in symbiosis with us, yet some bacteria can be highly pathogenic. The overall mortality rate from infectious diseases in the US fell by 75% over the first 15 years following the discovery of antibiotics , and researchers estimate that antibiotics have increased our lifespan by 2 to 10 years  by enabling us to fight infections that would otherwise be deadly. However, evolution has taught bacteria to fight back. Bacteria develop drug resistance through the acquisition of genetic mutations that either modify the bacteria's binding sites (and therefore the drug can no longer enter the membrane), or reduce the accumulation of the drug inside the bacterium. The latter happens through proteins called "efflux pumps", so called because their function is to pump drugs and other potentially harmful chemicals out of the cell. Once these advantageous mutations appear in the population, they spread very quickly, not only because they are selected for, but also thanks to bacteria's ability to transfer genes: the drug-resistant genes form a circular DNA unit called plasmid, and the unit is passed on to nearby bacteria so that they, too, can become drug resistant. These mechanisms are not new to bacteria, however, what's new is the increasing overuse of antibiotics and antimicrobial chemicals in our modern lifestyle. The antimicrobial agent called triclosan, for example, can be found in all antibacterial soaps, toothpaste, mouthwash, detergents, and even toys and kitchen utensils. Because of its wide use in household and hygiene products, triclosan has been found in water, both natural streams and treated wastewater, as well as human samples of blood, urine, and breast milk. As though that alone wasn't enough to alert consumers, a study published on the Proceedings of the National Academy of Sciences  claims that triclosan, which can be absorbed through the skin, can impair the functioning of both skeletal and cardiac muscle. The researchers confirmed these findings both in vitro and in animal models. Resistance is also spread through the use of antibiotics in industrial farming. In the US alone, the daily consumption of antibiotics amounts to 51 tons, of which around 80% is used in livestock, a little under 20% is for human use, and the rest is split between crops, pets, and aquaculture . A meta-analysis published last year in PNAS  found that between 2000 and 2010 the global use of antibiotic drugs increased by 36%, with 76% of the increase coming from developing countries. The researchers projected that worldwide antibiotic consumption would rise by 67% by 2030 due to population growth and the increase in consumer demand. These frightening statistics prompted CDC director Tom Frieden to issue a warning: "If we are not careful, we will soon be in a post-antibiotic era." An era when common infections are deadly again. "We need to be very careful in using antimicrobial agents for everything from hand washing to toothpaste," Harshini Mukundan, microbiologist at Los Alamos National Laboratory, explains. "Increased selection of drug resistant organisms means that future generations will be helpless in fighting even the most common bacterial infections." Mukundan and her colleagues have been working on biosurveillance and tracking the emergence of drug resistant strains in high disease burden populations where emerging antibiotic resistance is a huge concern. In collaboration with the Los Alamos National Laboratory metagenomics group, and Los Alamos scientists Ben McMahon and Norman Doggett, the team is working on developing new assays for faster diagnosis of drug resistant infections. Another approach to fight drug resistance is trying to understand how bacterial efflux pumps work at excreting the drug out of the bacterium. Gnana Gnanakaran, a computational biologist at Los Alamos National Laboratory, and his team have developed mathematical models to describe the structure of these pumps  and find a way to deactivate them. "New data suggest that the risks associated with long-term, daily use of antibacterial soaps may outweigh the benefits." In its 2011 policy paper, the Infectious Diseases Society of America (IDSA) recommended a substantial reduction in the use of antibiotics for growth promotion and feed efficiency in animal agriculture, and encouraged the FDA to complete and publish risk assessments of antibiotics currently approved for non-therapeutic use. Just like any other precious resource, antibiotics (and antimicrobial drugs in general) need to be used with parsimony. Disclaimer: Elena E. Giorgi is a computational biologist in the Theoretical Division of the Los Alamos National Laboratory. She does not represent her employer's views. LA-UR-16-22281. Resisting Bacterial Resistance, by Rebecca McDonald, 1663 Magazine.